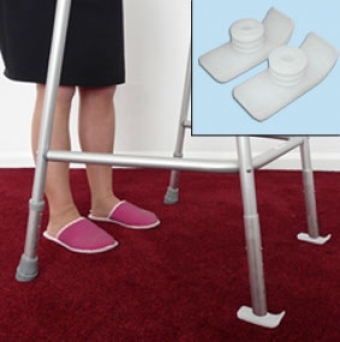 Walking Frame Carpet Glides Improves Manoeuvrability. Walkers, or zimmer frames can provide real help when trying to lead an independent lifestyle. However, one of the drawbacks is that carpets, or uneven surfaces can compromise walker safety. These walking frame glides are easily attached to walker legs. The benefits are instant – they not only improve the balance of your walking aid, but also create a smoother glide over all surfaces. 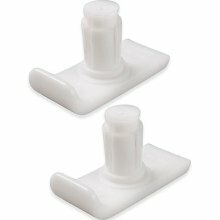 Whether you’re traversing over wooden floors, patio, or pavements, these zimmer frame carpet glides will make for less wobble and more stability. Set of two, insert easily into most standard 1 ½" diameter legs. Measures 3 ½" L x 1 ¼" W.